It’s the time of year again when we begin ramping up plans for the New Mexico Pilgrimage for Unity. This will be our third year and we couldn’t have made it this far without the generosity of organizations like Beads on One String. Your work blesses us all. This year, we are introducing a new concept into the pilgrimage. Borrowing from a model that we learned from the Quakers, we are implementing a Pay-As-Led approach to cover our costs. We will give each pilgrim some basic information about what it costs per person to produce the pilgrimage. Then we ask them to pray over and make a spirit-led decision as to what they think they can afford. This is in keeping with our guiding principle that the pilgrimage should be accessible to everyone regardless of their income level. To cover any shortfall, we are endeavoring to create an equalization fund and we are asking our sponsors to contribute to that fund…we are calling this our “experiment with abundance”. Every step is a prayer. Every prayer becomes a blessing. Every blessing leads to intercession. Every petition takes us further along the road. 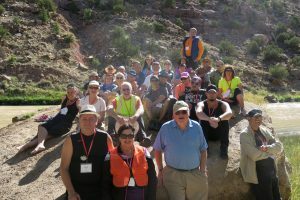 The 2017 Pilgrimage for Unity united thirty one pilgrims from New Mexico and Texas in three days of walking and praying from Ghost Ranch, a Presbyterian Church Education Center, to El Santuario de Chimayo, a Roman Catholic holy site of healing and prayer. Pilgrims were Catholic and Protestant; ages ranged from twenty-two to seventy-one; there were six clergy from four Protestant steams and lay members engaged in ministries within their parishes and communions. We prayed as a group to begin and end each day; as individuals carrying requests from our communities; as grateful recipients of hospitality. We sang our blessing song over all we encountered; we sang as the walk grew long (and our feet hurt); we sang spontaneously and joyfully. And we listened. We listened to wise words from religious leaders at our various stops; to guidance from our leaders and spiritual directors; to the soul stories shared by our companion pilgrims; and, in silence, to the intimate calling of God within. We crossed boundaries. We walked further than we expected. We shared our very different background and settings. We gave whatever we had, especially encouragement, to all in need. We compared personal devotional practices and learned the distinctions of our congregations. We stretched our hearts toward those who were mourning. Our smiles covered those with good news to share. Our differences shaped our unity, even as they affirmed our uniqueness. Our dedication to the walk as pilgrims sharpened each individual’s personal journey. Together, we were a pilgrimage of unity displaying by every step, every prayer, every blessing, every intercession, every petition the vibrancy of God’s love as we walked. New Mexico Pilgrimage for Unity, LLC.